The second tour for today is for an adult paranormal romance series, The Light Series by Jennifer DeLucy. The first book, Seers of Light, and the second, Whisper of Light, are available now. This tour is presented by A Tale Of Many Reviews Book Blog Tours. Our review as well as a giveaway can be found below. Summary: Lillian Hunt has never truly lived. Always sensing more to the world than is easily perceived, she fears that her instincts are stubborn flights of fancy, or worse, mental instability. But some things-disappearing strangers, tangible dreams, and visits from malevolent creatures-cannot be ignored. Before it's too late, Lillian is ripped from the only existence she's ever known and thrust into a reality that she always suspected, but could scarcely believe. She must learn the truth about who she is, the powerful beings that wish to destroy her, and the two men who would die to protect her. 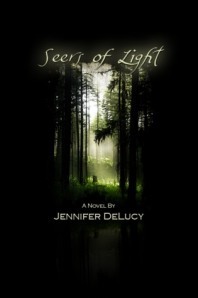 Jennifer DeLucy has created a unique, enchanting tale of destiny and the ageless power of love in her debut novel, Seers of Light. 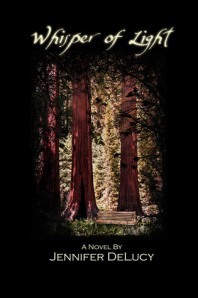 DeLucy's novel charms readers with quirky characters, while sketching a haunting portrait of one woman's journey on the path of the supernaturally gifted. But be prepared. Once you've entered the world of Seers, you will never be the same. Summary: The saying goes that all men are created equal... but Nicole Abbot knows better. Lacking the supernatural gifts of the Sentients she has known all her life, Nicole has lived with her nose pressed to the glass, withering beneath the guilt of her own inadequacies and the disapproving glare of her father. It's easy to believe that the universe has forgotten all about her, but things are not always as they seem. With the arrival of Christian Wright, a handsome but complex Combatant with a troubled history, Nicole is forced to question everything she has ever believed about herself, proving that sometimes, our most flawed perceptions are those reflected in a mirror. Jennifer DeLucy again plunges us into the world of lingering spirits, dark apparitions, and malicious vampires. But this time she takes us to the California coast where we get to know a new ensemble of gifted souls that are just as vibrant and endearing as the Sentients we came to love in Seers of Light. In Whisper of Light, DeLucy delivers exciting supernatural encounters as well as very human interactions that will both break your heart and make it soar. About the author: Jennifer DeLucy is the author of The Light Series, as well as a free-lance editor. Jennifer grew up in the valley city of Scranton, Pennsylvania, where she developed an obsession with all things literary and musical thanks to the influence of an extroverted and creative family. Currently living in the Midwest, Jennifer continues to pursue opportunities as an author, editor and musician. She is determined to put her love of the arts, nature and spirit to good use, broadening minds and opening hearts in every way she can. I can't truly judge a book by its cover and Seers of Light is a prime example. Even though I liked the woodland scene on the cover, I felt it didn't make me want to pick this book up if I spotted it on a bookstore shelf. Luckily for me, I signed up for a book tour and jumped at the chance to read this series. Surprise, surprise, that was my reaction when I became totally engrossed in this story. I had no idea what author Jennifer DeLucy had planned for her readers and I found myself thoroughly enjoying Lillian's story. Lillian is 28 years old, a college graduate, working in her grandparent's store, and going home to her apartment at night, alone (she has a grumpy cat). She is drifting; her life is unfocused and she is unfulfilled. It's almost as if she's waiting for something or someone to give her direction. Some strange things happen to her--a James Dean lookalike pulls a gun on her, a weird shadow pops up in her bedroom--and she's reaching for the phone, trying to make an appointment for a psych consult. But it isn't until she is attacked while on a walk, and subsequently rescued, that Lillian realizes the need to find out exactly who and what she is. Saved by an Englishman named Christian, he convinces her to let him take her back with him to a place where she can find answers. Others have complained about her ease in leaving with a stranger and I had no qualms with it. Lillian explained herself and rallied against her decision before ultimately giving in and letting Christian help her. She felt she could go with him and feelings is a big part of this series. As a Sentient and also someone who is an empath and able to cross over souls, Lillian has strong powers. Vampires crave her powers and she learns about the evil in the world from the other Sentients at the house she is taken to. Their leader is Abram, an elderly fellow Lillian has spoken to in her dreams so she isn't crazy. She just has twenty-eight years worth of supernatural learning to catch up with. There is a good cast of characters in this story. From over-protective Christian and his loving mom and sister, to the wise elder Abram, each individual plays an important role in Lillian's education and they become her family. The two characters I thoroughly enjoyed and loved were Lillian and William. Lillian's prejudicial views almost blind her to the real man William is and over time the wall she put up begins to crumble. Watching these two--he as her instructor, she as a strong minded student--is the heart of this story. Their scenes run the emotional gamut from seething hatred to calling a truce, from understanding to compassion and finally, to awakening of feelings for each other. Woven throughout their relationship is the fantastical world of the seers and sentients, special humans with powers, and the other otherworldy beings they encounter from spirits to incubus and dangerous vampires. I found the world the author created thrilling and interesting. There were some instances when there was too much dialogue and I would have liked some more action scenes but what Jennifer DeLucy shared with me upon these pages kept me reading for hours, caught up and riveted to Lillian and William's truly poignant love story. The blanket at night scene and the tutoring session in Lillian's bedroom were some of the most romantic scenes I've read in paranormal stories this year. I will admit Lillian wasn't the only one falling in love with a man so deserving of affection. Coupled with the intriguing world of Sentients, Seers of Light has climbed to the top of my Favorite Reads List of 2012. Book source: Received a promotional copy from the publisher for my honest review during a book tour. Omnific Publishing has very generously offered 1 ebook copy of both books in the Light Series for up to 14 winners!!! I've never heard of this series before this post, but it looks AMAZING. Thank you so much for offering the giveaway, too! The blurb sounds great. I like finding new series and I want to read this one. We hope you both get to read this series! Looks great. I would love to read this story.